We regret that due to unforeseen circumstances, Mark's Wednesday event is cancelled. Stay tuned to our website and newsletter as we work to reschedule. Screenwriter and author Mark Frost, known for his work on “Twin Peaks” and The List of Seven for adults, introduces readers to teen Will West and his adventures at the Center for Integrated Learning in his YA cross-genre debut, The Paladin Prophecy. The first in a trilogy, the novel has already been purchased for film development. Mark will speak about connections to Hollywood and his extensive history with developing stories from concept to feature films. Debut Author Mark Frost Visits Mrs. Nelson's! Mark Frost signs Game Six: Cincinnati, Boston, and the 1975 World Series: The Triumph of America's Pastime. Mark Frost is currently considered a "single author." If one or more works are by a distinct, homonymous authors, go ahead and split the author. 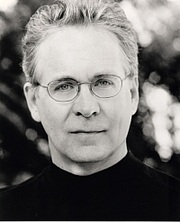 Mark Frost is composed of 3 names. You can examine and separate out names.